This past week both me and K have taken a little break from work! So what we needed!! Though we had some important business to take care of first - finding a new flat! Which fingers crossed we have and shall be moving in the end of September!! Then we popped up to Manchester for a few days. 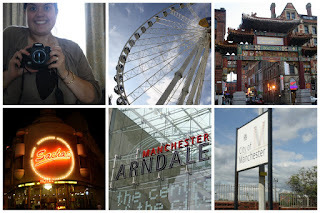 We staying in a lovely hotel and spent the day wandering around the shops in Manchester. It was defo a very nice time spent together. I have also scrapped a little too - a couple of layouts. One of my sister on her 21st Birthday and the other is of my friend Michaelanne. She is American and lives over here with her British hubby! Now in honour of her we had a 4th July BBQ! And as you can see from this photo she was was one happy girl!!! Also here is a sneak peak of my lo for the forthcoming challenge on 1st over on Butterfly Crafts! Also on 14th August there will be a cyber crop over on the forum!!! Yay for 4th of July parties! Fun LOs and yay for trips away. We have set ourselves a challenge and a treat to get our flat decorated in a week and a half, then we can have our reward of a weekend in Liverpool, here's hoping it works!